Dr. 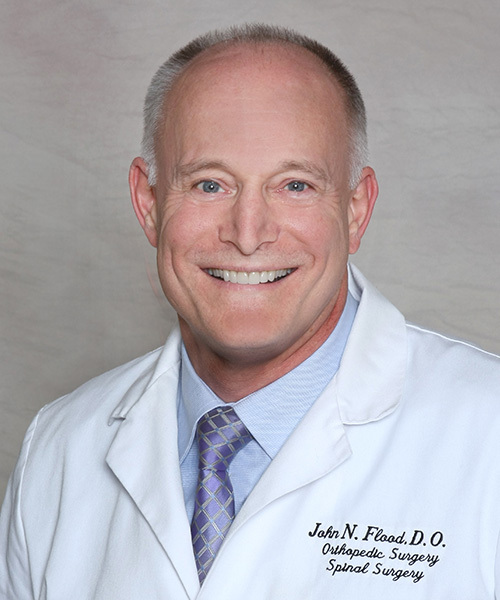 Flood specializes in the treatment of a variety of orthopedic conditions and performs several orthopedic procedures with an emphasis on adult spinal surgery. A native of North Olmstead, Ohio, Dr. Flood completed his undergraduate work at the University of Akron and received his Doctor of Osteopathic Medicine from Ohio University, College of Osteopathic Medicine, in Athens, Ohio. Dr. Flood completed his internship at Doctors Hospital, in Massillon, Ohio, and his orthopedic surgery residency at Doctors Hospital in Massillon, Ohio. Other postgraduate training includes a spinal surgery fellowship at Michigan State University. He continues to take advanced postgraduate courses and is a frequent lecturer on spine related topics.